Whether you call ‘em franks, hot dogs or wieners, it’s just not summer without hot dogs on the grill. If you’ve got a craving for a mouthwatering frank, check out this list of 10 hot dog joints in Oklahoma that will serve one or two up hot. Since 1926, Coney I-Lander has been providing great tasting food for a great price. There are seven metro locations open seven days a week. These hot dogs are similar to Cincinnati Coneys with lots of shredded cheese and served on a steamed bun. Mutts is a different hot dog joint, serving gourmet dogs with specialty ingredients, like The Philly, a beef frank with grilled onions and poblano peppers and queso. If you’re adventurous, you’ll find sausages made with bison, duck, wild boar and rabbit. Mutts also has locations in Edmond and Midwest City. Siegi’s makes its own sausage and wieners in the German tradition. 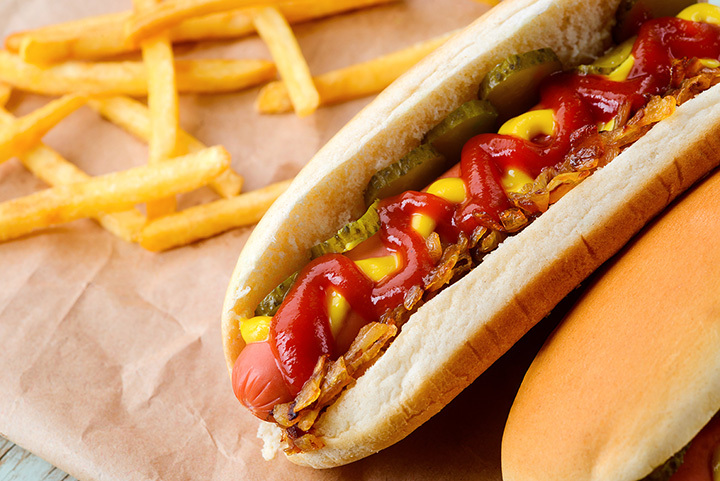 The frankfurter is made from beef and pork, then lightly smoked. Get it on a plate with sauerkraut and hot German potato salad instead of a bun. Sure, you can get a regular Coney at Gnarley Dawg, but you can also upscale your beef hot dog to a gourmet delight with mac & cheese, egg salad or hash at this Tulsa restaurant. Savastano’s might be famous for its Chicago-style pizza, but it offers Chicago style dogs on its menu for those who want to try an authentic “red-hot” dog. A traditional Vienna beef hot dog, just like you might have got at the 1893 World’s Fair. The ballpark might be the most traditional place to get a hot dog while you’re catching an Oklahoma City Dodgers home game. Baseball, hot dogs and apple pie go together. Diamond Dawgs serves its dogs on six-inch La Baguette buns, then tops the dogs with specialty items like popcorn shrimp and fried okra, or Cap’n Crunch cereal for an interesting twist on the corn dog. Located in Winstar Casino, NYC Burgers & Dogs serves up a bacon-wrapped hot dog that’s deep-fried and served on a buttery New England style roll. If that’s not your thing, you’ll find regular dogs with typical toppings. Top Dog Classic Coneys was first in “Best Hot Dog” in the Norman Transcript Reader’s Choice Awards. Just good old-fashioned hot dogs with chili and cheese in a casual environment.